It’s always good to broaden your product range as a means to improve your shopping cart sales but to do this you would have to be very aware of what’s hot or has the potential to be hot in the market you’re in. Successfully marketing a hot product will result in a spike in your shopping cart sales. If you’re lucky and the product does not turn out to be a fad then you might be looking at a medium to long-term cash cow. In this post, as an example, we shall take a look at one particular product that is slowly gaining attention. We will also look at the different niches this product can cater to. The road to super shopping cart sales is often paved with simple ideas and creativity. In 1960 at the Rome Olympics, Ethiopian Abebe Bikila won the Marathon event in a then world record time of 2:15:16. The amazing thing was he did it barefoot. Unbeknown to most of us, there has been a growing debate about shod vs unshod (feet). Many experts agree that shoes encourage heel striking when running, as opposed to mid-foot or fore-foot striking when running barefoot. However, some experts are quick to point out that barefoot running isn’t for everyone. It is not our place to say which the better way to run is but there may be a way to cater to both groups of runners. “Both groups?”, you might ask. “But barefoot runners don’t wear shoes!” Right? 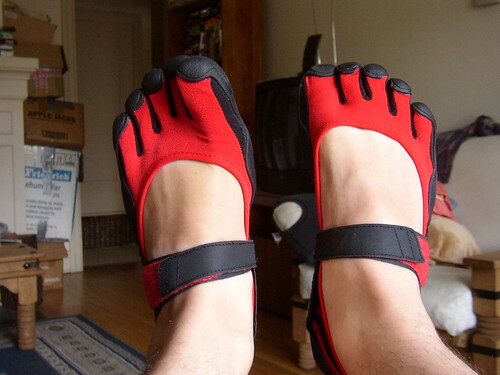 Enter Vibram FiveFingers (see photo above). The smart people at Vibram, realizing that our ancestors didn’t run barefoot on hard asphalt, decided to invent a shoe that acts like an outer protective skin on our feet so we too can run everywhere barefoot. Well, almost. Vibram made a name for themselves by creating durable yet sticky out soles used by many famous shoe brands for their higher end off road shoe models. Vibram has already got a few models to cater for sprinters, hikers as well as for regular walkers. If you have a web store selling sports shoes (not limited to this), you could add this as one of your products for people who would like to try “barefoot running”. Those who are already into “chi” or “pose” running and want to strengthen their feet further can also try this. This shoe is an example of how a creative idea that suits a particular niche really well can be broadened to fit a larger market as well. You see, basically this particular product isn’t just for runners, it’s for those who want the feel of walking/running barefoot but don’t want the risk of getting cut by glass or other sharp objects one might find on the ground. It’s less restrictive and is great for just walking around the house, doing some gardening or even mowing the lawn. Also, the grippy out soles work well in the wet so marketing these “shoes” to water sports enthusiasts is a valid option as well. Looking at the flexibility and minimalist character of these “shoes”, they may also work for rock climbers. So there’s another niche you can look at. The point of all of this isn’t to introduce you to a different running style and to promote a shoe, but to illustrate the point that creating shopping cart ideas needs a bit of thinking out of the box. Adding an up-and-coming product to your product list is a neat way to improve your shopping cart sales figures. Of course some might just turn out to be fads like those Asics Onitsuka Tiger shoes Uma Thurman wore in Kill Bill. Still, as long as a product generates income while it’s in vogue, you can’t complain much. Retail Outlets Won’t Carry Your Brand? Launch A Web Store And Sell It There. Have You Tried Google’s New Keyword Research Tool With Insights For Search?